Nogalus Prairie Texas, Nogales Prairie Texas, Nogallis Prairie Texas. The names of some East Texas towns can be downright confusing. And much of the confusion arises from mispronunciations which, during the passage of time, have become actual names. Take, for example, the name Nogalus Prairie in Trinity County. Local lore suggests the name originated when two horse thieves were hung from the branch of a large tree because the community had "no gallows." 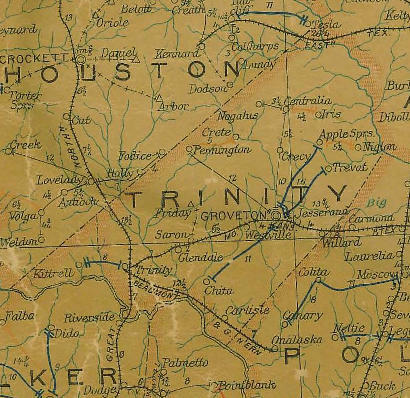 While a morsel of truth may lie in the story, Clell Davis of Trinity County helped shed some light on the community's real origin. The community was originally named Nogales Prairie because of the walnut and pecan trees that grew there when Texas was still a province of Mexico and Spanish families lived in the area. Nogales is Spanish for walnut and sometimes pecan. When the first European settlers came to the area, they spelled the name like it sounded, and Nogales became Nogallis. The first post office opened in 1858 as Nogallis Prairie. In the late 1800s, it was sometimes called Logallis Prairie, but in 1894 the post office was known as Nogalus Prairie. No less than John Wesley Hardin, the preacher's son and outlaw who spent a lot of time in Trinity County, mentioned the name in his autobiography, "The Life of John Wesley Hardin." Hardin shot and killed a former slave near Moscow in Polk County in the fall of 1868 and was on the run from federal reconstruction troops. His brother Joe was teaching school "on Logallis Prairie, about twenty-five miles north of Sumpter" and John Wesley fled there. When Joe also told him that federal troops were coming to arrest him, Hardin waylaid and killed three soldiers in a bed of a deep creek. He buried the bodies in the creek bed about 100 yards from where the fight occurred. Some 55 years ago, as a young boy growing up at Nogalus Prairie, Clell Davis was walking along a creek bed and found some bones. "That night at supper, I told my father about it, and he told me that his grandfather, Alexander Davis, told him that back in the l800s, a man shot three men and buried them near the creek bed," said Davis. "The story really got my attention, but for some reason I never went back to look for the bones and, after 55 years, I had almost forgotten about it until I read Hardin's book," said Davis. Today, however, the creek has been dammed and a pond covers the site. "A short distance from there, you can see the old roadbed where it used to cross the creek, and I believe this is where John Wesley Hardin shot the Union soldiers and where they were buried," said Davis. As far as hangings are concerned at Nogalus, there were a number that occurred in the vicinity during and after the Civil War. During that time, a large group of Civil War deserters were camped in the community when they were chased down and hung from convenient tree limbs. From the 1840s to about 1900, Nogalus Prairie was a "fair sized community," said Davis. From 1900 to 1918, the community had a Methodist church, several stores and saloons, a cotton gin, grist mill, and a Woodmen of the World lodge. The post office closed in 1920 and today Nogalus is mostly a dispersed rural community. Its last population figure in 2000 was 106. Distributed by the East Texas Historical Association. Bob Bowman of Lufkin is a former president of the Association and the author of more than 30 books about East Texas.